"It is lucky perhaps that Bloomsbury has a pleasant reverberating sound, suggesting old fashioned gardens and out of the way walks, and squares; otherwise how could one bear it? If every review, every talk on the radio, every biography, every memoir of the last fifty years, were to talk instead incessantly of Hoxton or Brixton, surely one's nerves would be unbearably frayed." The Bloomsbury artists were a group of innovative British artists, designers, and art critics who breathed fresh life into the UK's stuffy art scene in the first half of the 20th century. The group's members contributed significantly to 20th-century British art and design by working on a huge range of individual and collaborative projects, from cushion covers and candlesticks to abstract paintings and multiple murals. They are also credited with introducing important European artists such as Picasso and Cézanne to a UK audience. The Bloomsbury artists as we refer to them here were the original, artistic arm of the Bloomsbury Group, a broader set of London-based creatives and intellectuals that included novelists Virginia Woolf and E. M Forster, economist John Maynard Keynes and writer Lytton Strachey among its most prominent members. Whether through painting, novel writing or philosophy, all members of 'old Bloomsbury' shared a passion for social progress, creative innovation and a desire to leave behind the restrictive atmosphere of the Victorian era. The group's artistic output was highly influenced by art critic and fellow Bloomsbury member Clive Bell's theory of 'significant form'. Bell believed that forms and relations of forms within an artwork combine to "stir our aesthetic emotions", even when entirely isolated from a discernible reality. 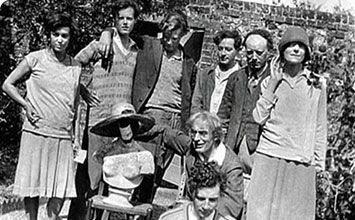 Unsurprisingly for a group whose personal lives were so infamously intertwined, the three principal Bloomsbury artists - Vanessa Bell, Duncan Grant, and Roger Fry - often worked in remarkably close proximity to each other. They regularly painted the same subjects at the same time (mainly interiors, scenes from their joint travels to Europe, still lifes, and portraits of other group members) though their styles remained reasonably distinctive. The Bloomsbury artists were strongly influenced by and responsive to the European movements of their day, especially Post-Impressionism (a term coined by Roger Fry) and Cubism. Their previously conservative artistic styles changed dramatically after they viewed works by Picasso, Matisse, and Cézanne during a 1909 visit to Paris. The group is now widely recognized as important British 'champions of modernity' for being the first to include these controversial European artists in London exhibitions, much to the shock of UK gallery goers. Collaboration and cross-promotion were fundamental to the Bloomsbury ethos. As well as working with each other on murals, interiors, stage designs, and costumes, the group's visual artists produced book jacket covers and illustrations to accompany publications by Bloomsbury writers and their modernist associates, including works by Virginia Woolf, T.S Eliot, and some of the first English translations of Sigmund Freud. The entire Bloomsbury group's attitudes toward gender roles and sexuality were extraordinarily progressive, especially by the standards of their day in Britain. These attitudes often translated to the group's artistic output - they produced some of the earliest works to now be considered essential to the Queer art canon, for example. Virginia Woolf's seminal essays, such as A Room of One's Own, also had a vital impact on the development of feminism (including Feminist art) in the 20th century and beyond. When upper-middle-class man of letters, Leslie Stephen, died in 1904, his daughters Vanessa (later Bell) and Virginia (later Woolf) - an aspiring painter and novelist respectively - decided to move out of their family home. With a strong desire to leave behind their uptight Victorian upbringing and live a freer, more 'Bohemian' lifestyle, they and their two brothers, Thoby and Adrian, set up residence at 46 Gordon Square in Bloomsbury, then regarded as a rather downscale area of London. This series of murals, commissioned and installed in London's Borough Polytechnic's canteen, is a key example of the Bloomsburys' collaborative philosophy in practice. Lively and startlingly modern for the time, the figures in the various panels are depicted participating in what were decidedly contemporary recreational activities, such as swimming in London's Serpentine Lake and playing football in the city's Hyde Park. The project was devised and led by Roger Fry, though he was loose in his approach to leading it. He relied on the murals' theme, 'London on Holiday', a shared palette and an understanding that all the artists would paint outlines using a style inspired by Byzantine mosaic to give individual sections a coherent feel. The project's significance lay in its democratic subject matter and setting - it's now seen as a key work in the history of Public art, realized as it was at low cost and in a college refectory rather than a grand museum or gallery. The project was run on a tight budget of £100, meaning the murals were painted in oil onto canvas panels instead of directly on the walls - a decision that ultimately led to their preservation when the Polytechnic's building changed ownership in the 1930s. This design for a set of candle shades was one of the earliest produced for the Omega Workshops - the collaborative, Bloomsbury-led decorative art initiative conceived by Roger Fry in 1913. Featuring radical, highly pared down forms and bold colors that reflect the techniques and ideas of the Post-Impressionists, these designs are archetypally Omega. In contrast with previous, comparable schemes that blurred the boundary between art and design - most famously William Morris's Arts and Crafts movement of the late-19th century - Fry was determined that Omega artworks focus purely on aesthetic merit, rather than aiming to make political or social points. A prolific painter, novelist, and critic, Wyndham Lewis was a key - though brief - early associate of the Bloomsbury Group. He exhibited three oil paintings at Fry's second Post-Impressionist exhibition of 1912 and produced several popular designs for Omega, but had a dramatic and high profile falling out with Fry and Clive Bell in 1913. He went on to found rival decorative workshop, the Rebel Art Centre, and the short lived but highly influential Vorticist movement, considered the first truly avant-garde art movement in the UK. The Vorticists explicitly rebelled against what they saw as the horribly bourgeois Bloomsbury artists in particular - Lewis sneeringly described them as 'Fitzroy tinkers'. He reserved particular wrath for Fry (who he called a 'shabby trickster' and 'hypocrite') and Virginia Woolf (a 'peeper' into other people's affairs.) This feud with the whole Bloomsbury Group would ultimately last for decades - in 1930, Lewis expressed his continuing disdain for London's literary and artistic set in a biting satirical novel, The Apes of God. In River With Poplars, Roger Fry painted the view from a bridge in the village of Angles sur l'Anglin at Poitiers, France, using bold, uniformly solid blocks of color to represent every element of the scene, including the water and cloudy sky. Fry had been inspired by the work of iconic Post-Impressionist Paul Cézanne when creating the piece, though the birth of his interest in the French painter sadly coincided with Cézanne's death in 1906. By the time River With Poplars was completed in 1912, Fry had been working according to his own aesthetic theory based on Cézanne's methodology for several years - using careful brushstrokes to 'construct' an image rather than simply 'paint' it. His theory of significant form, which was enthusiastically embraced by the other Bloomsbury artists, also stressed the importance of form (by which he meant a congenial combination of line, color and overall composition) in invoking what he called 'an emotional response' in the viewer - an idea that's richly demonstrated here. From a contemporary perspective, Fry's individual artworks hold more symbolic than artistic significance. He's generally acknowledged as a weaker artist than, say, Vanessa Bell, whose abstract paintings from the same period are now widely considered revolutionary. His most important contributions to the Bloomsbury Group were as a theorist and curator (he was curator of European painting at MOMA in New York between 1906 - 10), but his experiments with Post-Impressionist techniques were crucial demonstrations of his seminal theories brought to artistic life. This aggressively expressive portrait by early Bloomsbury member Frederick Etchells is actually not a portrait of an individual woman, but a combination of the artist's sister, Jessie Etchells, and Madge Pulsford, a friend of the group. Etchells wanted to focus on form, line, and mood rather than making a traditional portrait of a single sitter. The strong outlines of the figure, chair, and cushions are all awkward and intentionally crudely painted, while the entire painting is filled with heavy, Pointillist-style dots. A trained architect as well as an artist, Etchells was friends with such European luminaries as Braque, Picasso, and Modigliani, and The Big Girl certainly feels influenced by these European painters' work. Its palette of soft pastels, for example, is typically Fauvist, while his stylized depiction of his subject is reminiscent of Modigliani as well as bearing a strong resemblance to the work of fellow Bloomsbury, Duncan Grant. Etchells was distinctive among the Bloomsberries for his unabashedly eccentric, even anarchic sensibility. Also a member of the Omega Works, he joined the rebellious and militant Vorticist movement soon after he completed this work, after eventually tiring of what he saw as the overly genteel Bloomsbury ethos. Abstract Kinetic Collage Painting with Sound showcases Duncan Grant's practice at its most outlandishly experimental. The 15 foot long painting is composed of 17 different images of various painted and pastel rectangles. It was originally intended to be gradually wound between two spools in a box, like a length of film, and viewed through an aperture to the sound of a piece of slow music by J.S Bach. Having given up attempting to make a suitable box and mechanism for displaying the piece at the time, Grant kept the painting in storage till he was able to show it as he'd envisaged - alongside a film commissioned by the Tate Gallery in 1974 that showed the (by then fragile) painting as close to 'kinetically' as possible. With its pioneering exploration of movement and multisensory experience and attempt to push painting as a medium into fresh, filmic territory, this piece is now considered a key work in the history of abstraction. Grant himself is generally regarded as one of the most gifted and consistently adventurous of the Bloomsbury artists, alongside his long term lover, Vanessa Bell. Tellingly, Grant and Bell were the only artists from the group to feature works in New York's Museum of Modern Art's global survey Inventing Abstraction in 2013, with critics singling this piece out for particular praise. Still Life On Corner Of A Mantelpiece, one of Bell's most important works from her Post-Impressionist phase, is an intensely colorful rendition of the mantelpiece at her house in Bloomsbury, 46 Gordon Square. It's painted from a low vantage point and depicts paper flowers made by members of the Omega Workshops and a pile of boxes in various bright hues. Between 1914 - 16, Bell was highly influenced by other European painters - her radical use of bold colors feels decidedly Fauvist, while the painting's abstracted forms are clearly reminiscent of Cubism. Both Bell and Duncan Grant (who painted Omega Paper Flowers On The Mantelpiece at the same time as Bell painted this) entirely prioritized the visual power of their work - its surface, use of color, and texture - over any conceptual concerns. They both explicitly rejected the idea that their paintings should be about something, unlike other modernist painters of the era who wanted their work to speak about big societal issues of the day. It was a revolutionary approach that Bell pursued enthusiastically in the years leading up to WWI - widely regarded as her most exciting period - in which she produced a series of radical experiments in form, color and abstraction. Yet her distinctive take on Post-Impressionism has only been properly recognized in the 21st century, almost 100 years later. This intimate portrait of biographer and critic Lytton Strachey reading a book was painted by his lover Dora Carrington. As with Duncan Grant's painting of his lover, John Maynard Keynes, there's an overwhelming warmth and tenderness to the image, which presents Strachey's characteristic bearded profile in a soft, flattering light. Though not a core Bloomsbury artist, Carrington (she preferred to be known by just her family name) regularly exhibited with the group, and was often commissioned to anonymously produce decorative items for Roger Fry's Omega Workshops as well as book covers for the Woolfs' Hogarth Press. As a Bloomsbury outlier rather than a central member, Carrington also developed her own, singular take on the European artistic styles that were to influence the group's core members. While Vanessa Bell, Duncan Grant, and Roger Fry were swept up by Post-Impressionist ideas and techniques in their entirety around this time, Carrington took a more measured approach. Instead, her paintings combined a Post-Impressionist approach to light and brushwork, a sense of emotional weight influenced by the Pre-Raphaelites and a palette reminiscent of early Renaissance art, creating less overtly modern - though still fresh - work firmly rooted in painterly traditions. The Berwick Church Murals were a collaborative, cross-generational Bloomsbury endeavor. The series features a very Bloomsbury-style take on traditional Christian imagery, including the Annunciation, the Nativity, the wise and foolish virgins, and Christ in glory. Duncan Grant was initially commissioned in 1940 to paint the decorations for the small church in Sussex, England, and he invited his long-term collaborator, friend, and erstwhile lover, Vanessa Bell to join him on the project, along with her children, Angelica and Quentin. The artists all posed for each other in biblical dress as well as engaging local farmhands as additional models. The scheme met with disapproval from a group of churchgoers, who objected to the modernity of the designs. The murals went ahead despite their objections after a two year delay, though Grant was made to render his version of Christ so it was less 'fleshy' and more classically divine in appearance. Once the panels were installed, however, they were broadly praised, with Sir Charles Reilly (the project's founder), describing them as "like stepping out of a foggy England into Italy."